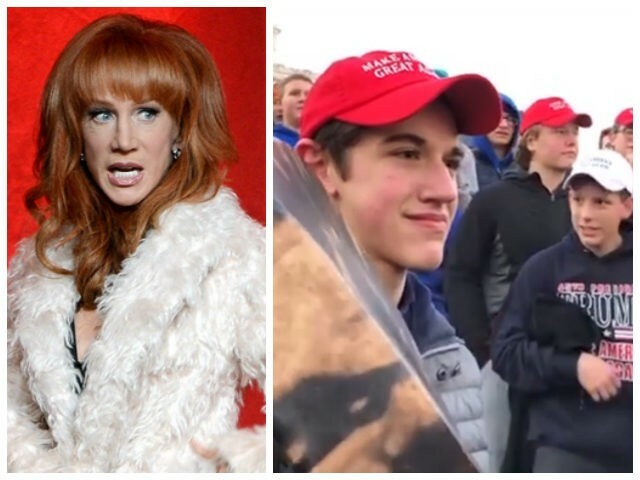 Comedian and far-left activist Kathy Griffin called for doxxing and publicly shaming the high school students at Friday’s March for Life who were accused of mocking a Native American man. “Ps. The reply from the school was pathetic and impotent. Name these kids. I want NAMES. Shame them. If you think these fuckers wouldn’t dox you in a heartbeat, think again,” Kathy Griffin said in a social media post Sunday. Controversy erupted this weekend as many social media users spread a brief video clip of students from Covington Catholic High School allegedly mocking a Native American Vietnam War veteran at the March for Life in Washington, D.C. on Friday. CNN and many other new outlets amplified the social media campaign with news articles about the encounter. However, as Breitbart News’ Joel Pollak reports, video footage of the full encounter now calls into question these earlier reports. The new footage reveals that the Native American man, Nathan Phillips, approached the students with his drum and beat it in their faces. Griffin’s effort to public shame these students is par for the course for her social media activism. Since losing many professional opportunities after she mock-beheaded President Trump in a 2017 photo, the star has committed herself to full-time Trump hatred.